how NOT to make it » Blog Archive » Literally thousands of projects? Uh, you sure about that? Admittedly, I receive promotional emails from Voices.com so I can quickly peer over the fence to see what’s-what on that side of the voiceover world. Most of the time I roll my eyes at the self-hype and promises of success to new/wannabe VO talent that seems to involve more paying for seminars and conferences sponsored by voices.com than it does any sort of proper training or real world advice. But to each his own I guess. I see the email, I get the gist, I sigh, I delete it. That’s been my experience for years now, but today’s email has me all like Popeye, with a “Dat’s all I can stands, and I can’t stands no more!! !” Then popping a can of kale since canned spinach is risky these days. That’s amazing because I’ve literally never heard of this guy. 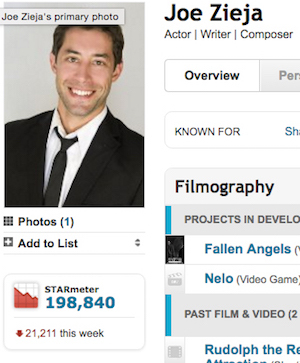 Yep… that’s his IMDB page with a whopping 12 credits. Look, nothing against Joe here. He could be a fairly successful actor who has done 988 elearning projects that can’t be credited on IMDB and who might happen to advocate, aka: pay, for Voices.com for all I know. The real beef here is Voices.com trying so hard, albeit poorly, to make attendees feel like this is actual advice and not just a money grab from talent. I’m not seeing any recognizable voiceover artist, casting, coach, or producer names in there, but then I did just get new Warby Parkers and it’s hard to see past my own vanity. But hell, all it takes to attend this invaluable one-day event…. is ONLY $325! Guess now I know where to learn how I can get my auditions turned-out in 30-seconds each! Take that stupid YouTube helpful instructional videos! I’ll let the commenters below talk about Voices.com’s more controversial practices of charging very high fees for improved access to the “bigger” auditions, and taking a percentage cut from the talent fee. I’m not a member, so I can’t speak directly to those issues. Getting my ticket to SFO now. This entry was posted on Wednesday, March 15th, 2017 at 18:45	and is filed under Casting Sites, The Bizness. You can follow any responses to this entry through the RSS 2.0 feed. You can leave a response, or trackback from your own site.